One of the fundamental goals of the Central Reform Congregation (CRC) is to strengthen the bonds of our community through communication and participation, while continuing our work of Tikkun Olam — the repair of the world. Our landscape includes an area we call “Common Ground,” located at the northeast corner of the property, a circular area of paving stones intended to welcome members of the surrounding community, in this diverse urban setting. In this garden space, we have placed a public sculpture as a landmark where the community is welcome to gather for marches, candlelight vigils, or prayer services. 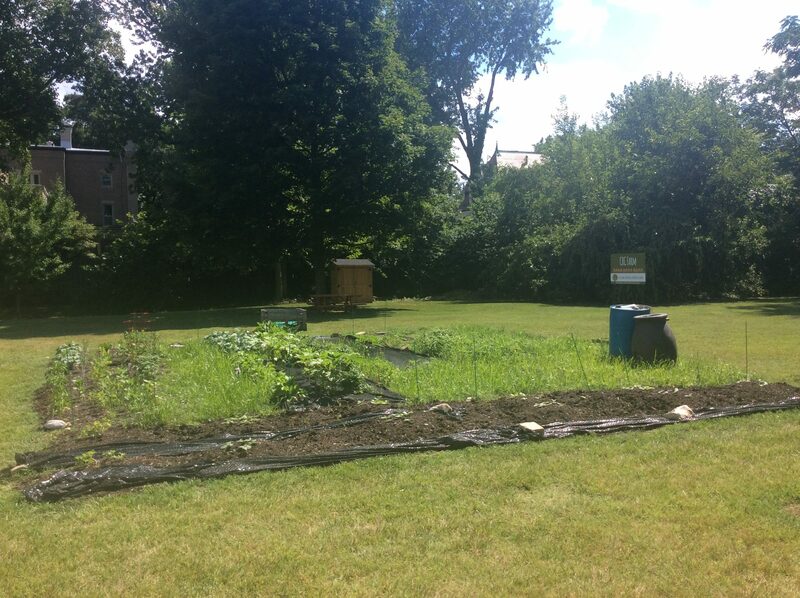 We have added 4 raised beds this spring to grow food and donate it to the local food pantry. We are building community with the gardens in the area, including the garden at Next Door and the Central West End farm, with the desire to build a thriving network. One day, we would love for the folks who use the food pantry to take over the gardening and maybe open a garden store for them to sell food and goods. I moved to St. Louis from Jackson, Mississippi hoping the weather would be cooler and less humid. I was wrong. And now, instead of working in an air conditioned office, my daily work life has changed dramatically. 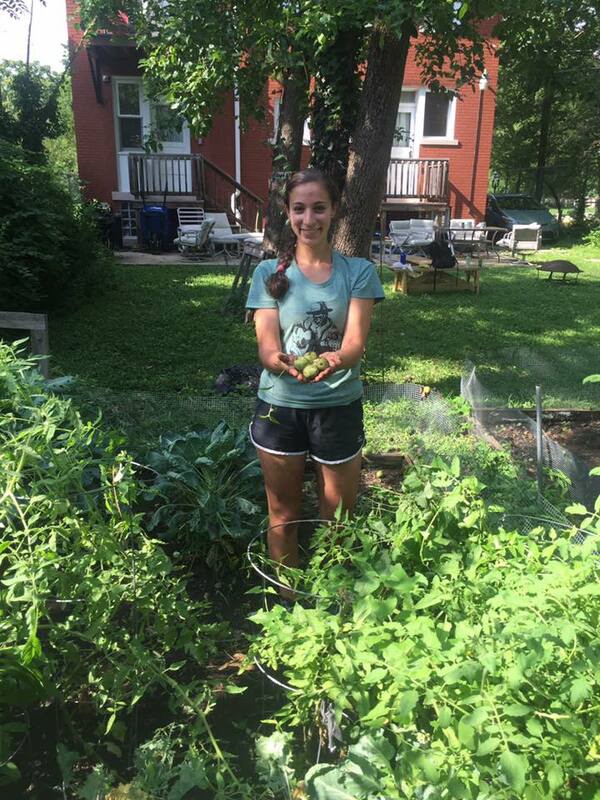 I moved to St. Louis at the end of July to work for The Amir Project, an organization that teaches young adults to run educational gardens at summer camps. In St. Louis though, Amir began a year-round initiative aiming to work with local community gardens in the hopes of providing support. More specifically, I work with the Garden of Eden at the JCC in Creve Coeur, the Central West End Farm, the Central Reform Congregation Community Garden, the Next Door garden, and the Transgender Memorial Garden. Through each garden, I’ve met people and made friends who have each taught me something unique, which made me realize how truly innovative the garden classroom is. At the Central West End Farm, under the tutelage of Arthur Culbert, I not only learned interesting things about plants and veggies, but also how to sustain a gift-garden. I learned to infuse vinegar with herbs, package the product, and sell it to community members, which ultimately brings money back to the garden for seed and seedling money. I know these are skills I will take with me moving forward. I am grateful that even though air conditioning is comfortable, that I got out of the office setting and into the garden setting. Gardening in St. Louis very quickly introduced me to the folks of the city, and I was able to meet and befriend people of all ages.